There has been a lot of comment recently that Switzerland has been excluded from EU science networks following a democratic decision by the Swiss people to not open its borders to Croatian citizens. 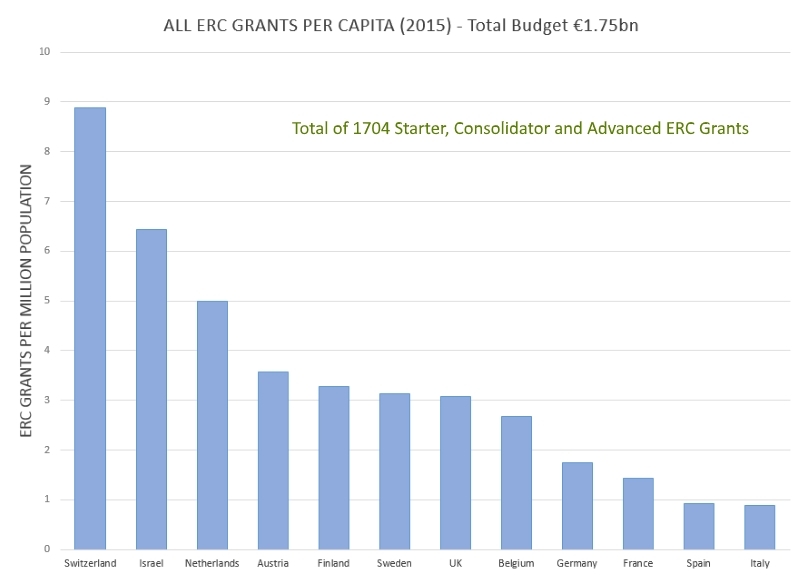 And yet a cursory glance at the 2015 grant allocations from the European Research Council (ERC), shows that non-EU Switzerland and Israel have significantly outperformed EU countries on a per capita basis. ERC Grants are thought to be the most prestigious component of EU research framework programmes, and account for around 20% of the current EU funding programme – known as Horizon 2020 . The truth is that Switzerland has partial-access to Horizon 2020 funding, but maintains full-access to ERC science grants. Just for clarity, Switzerland can still take part in all Horizon 2020 activities, but some aspects are EU funded, like the ERC, and some aspects are funded directly by the Swiss government. From the success of Switzerland and Israel, it is clear that political union is not necessary for an active and fruitful participation in EU science networks, let alone in European Science; and the associated membership of 15 non-EU nations to Horizon 2020 (on an equal basis) prove this fact. Why are we glad that Switzerland are still very involved in EU science ? … because science should be above politics, and the withdrawal of science participation should never be used as a political sanction against the democratic will of the citizens of a sovereign nation. You can read more about the ERC’s 2015 grant allocations here.